Jor-El, originally known as Jor-L, is a fictional character appearing in comic books published by DC Comics. Created by writer Jerry Siegel and artist Joe Shuster, Jor-El first appeared in a newspaper comic strip in 1939 with Superman. Scientific genius capable of inventing and applying extremely advanced technology; gifted philosopher and mentor, physical strength, agility and speed, kryptonite immunity. A Kryptonian, Jor-El is Superman's biological father, the husband of Lara, and a leading scientist on the planet Krypton before its destruction. He foresaw the planet's fate but was unable to convince his colleagues in time to save the inhabitants. Jor-El was able to save his infant son Kal-El (Superman) by sending him in a homemade spaceship towards Earth just moments before Krypton exploded. After constructing his Fortress of Solitude, Superman honored his biological parents with a statue of Jor-El and Lara holding up a globe of Krypton. Shuster and Siegel, Superman's creators, first introduced a character named "Jor-L" in 1936, more than a year before the first Superman story was published. The original "Jor-L" appeared in New Adventure Comics (released in 1936, cover-dated January 1937), a re-titled issue #12 of the previous New Comics, which would be re-titled again to become the 45-year-long Adventure Comics series after issue #32. Featured in the four-page Shuster and Siegel strip "Federal Men", this "Jor-L" was not an alien, but rather an "ace sleuth" in the service of "Interplanetary Federation Headquarters" who battles against "Nira-Q", the space-faring "bandit queen", in the year 3000 A.D. The 1936 "Jor-L" exists as part of a story within a story, as Shuster and Siegel's strip presents the tale as a scientist's forecast of future crime-fighting told to the contemporary 1930s-era G-man heroes of "Federal Men". Jor-El was first referred to indirectly in Action Comics #1 in 1938, which only mentioned a scientist who sends his son to Earth. He made his first full-fledged appearance in the Superman newspaper comic strip in 1939, where his name was spelled as "Jor-L". His name first appeared as being spelled "Jor-el" in the Superman novel The Adventures of Superman (1942) written by George Lowther. Later comic books capitalized the "E" in "El." Jor-El's first appearance in an actual comic book was in More Fun Comics #101. After the introduction of DC Comics' multiverse system in the 1960s, it was established that the version of Superman's father during the Golden Age of Comic Books was named "Jor-L", and he lived on the Krypton of the Earth-Two universe. However, "Jor-El" was the father of the Silver Age version of Superman, and he lived on the Krypton of the Earth-One universe. A retelling of Superman's origin story in 1948 first delved into detail about Jor-El. However, his formal and more familiar Silver Age aspects were firmly established starting in the late 1950s. Over the course of the next several decades, there was a definitive summarization in the miniseries World of Krypton in 1979 (not to be confused with the similarly-named post-Crisis on Infinite Earths late-1980s comic miniseries). As it was summarized in the World of Krypton miniseries (and in various other Silver Age stories), Jor-El was Krypton's leading scientist, having invented, among other devices, the "Jor-El," a hovercar, and having discovered a parallel plane of existence which he called the Phantom Zone, and having invented a device by which it could be entered, which he called the Phantom Zone Projector. This device got him a seat on the Science Council, Krypton's ruling body. He lived in Krypton's major city of Kryptonopolis. Even before Jor-El's birth, the El family was renowned across Krypton for its various contributions to Kryptonian society. Ancestors of Jor-El included Val-El, a famous explorer; Sul-El, the inventor of Krypton's first telescope; Tala-El, the author of Krypton's first planetary constitution; Hatu-El, the inventor of Krypton's first electromagnet and first electric motor; and Gam-El, the father of modern Kryptonian architecture. Jor-El had two brothers: Zor-El, who lived in Argo City and eventually became the father of Kara, alias Supergirl, and an identical twin brother named Nim-El, who lived in Kandor. In several stories, Jor-El's father was established as Jor-El I, and his mother as Nimda (nee An-Dor). Jor-El eventually met and married Lara, the daughter of Lor-Van and a young astronaut in Krypton's fledgling space program (which was soon permanently grounded after Jax-Ur blew up one of Krypton's inhabited moons, leading to eternal banishment to the Phantom Zone); the two had an infant son, Kal-El. When Krypton began experiencing a series of earthquakes, Jor-El investigated. He soon discovered, to his horror, that Krypton's core was extremely unstable and indeed radioactive, and worse, that it would eventually reach critical mass and explode, taking the entire planet and its populace with it. Jor-El tried to convince the members of the Science Council of this impending disaster and urged re-establishing Krypton's space program so giant spacecraft could be built to carry the populace to another habitable world. However, the Council was dismissive of Jor-El's findings and refused to comply with his plan. Some even accused him of treachery, trying to cause chaos so he could take over. This had been a plot of General Zod’s, which having failed, caused his banishment to the Phantom Zone. Thus the Council was wary of Jor-El’s motives. Around the time he discovered his homeworld's impending doom, Jor-El met his own son Kal-El without realizing it (Kal-El had accidentally travelled back in time). There were supporters of Jor-El's theory, but when a ship was constructed to evacuate them, the city of Kandor was shrunken and stolen by Brainiac, removing the people who believed in Jor-El's work. Frustrated, Jor-El continued his work on space travel on his own, hoping to build a spacecraft to save his own family. This work included launching several smaller test rockets; one of these rockets included the family dog, who responded to the name of "Krypto." However, as time ran short, Jor-El soon found that he would only have enough time to build a spacecraft to save his son Kal-El. He decided to send Kal-El to Earth, realizing he would gain superhuman powers under Earth's more intense yellow sun and lower gravity. As Krypton finally went through its final destructive stages, Jor-El and Lara placed their son in the rocket and launched him toward Earth, before they themselves were killed along with almost all the rest of the planet's population. Lara could have fit inside the rocket as well, but she chose to stay behind to increase Kal-El's chances of reaching Earth. After the 1985-1986 miniseries Crisis on Infinite Earths and John Byrne's 1986 miniseries The Man of Steel rewrote Superman's origins, details about Jor-El's background and character were changed. In Byrne's version, Jor-El inhabited a cold and emotionally sterile Krypton where even bodily contact was forbidden. Indeed, Jor-El himself was considered a "throwback" for actually expressing emotions toward his mate Lara and favoring the less sterilized days of past Kryptonian eras. Another change in this version was Jor-El genetically altering his son's fetus (gestating in a "birthing matrix") to allow him to leave Krypton (in this version of the mythos, Kryptonians were genetically "bonded" to the planet itself, not allowing them to leave) and merely attaching a warp engine to the matrix instead of constructing a ship wholesale. The result was that Kal-El was "born" when the birthing matrix opened on Earth. In the 1990s series Starman Jor-El meets a time-traveling Jack Knight and Mikaal Tomas, two individuals who both bore at various points the name "Starman", and had been accidentally sent 70 years back in time and hurled across space. Jor-El thereby first learns of Earth's existence; in return, Jor-El helps Knight and Tomas escape from his overbearing father Seyg-El. In the 2004 miniseries Superman: Birthright, Jor-El, along with Krypton and Lara, was, more or less, reinstated to his Silver Age versions, though with such updated touches as Lara contributing equally to the effort of sending Kal-El, once again an infant while on Krypton, to Earth. In this version, Jor-El discovers Earth moments before launching his son's spacecraft. Also, the conclusion of the miniseries has the adult Superman, on Earth, seeing his parents through Lex Luthor's time-space communicator, and on Krypton, seconds before its destruction, Jor-El and Lara see their son alive and well on Earth and know that their efforts were successful. As with Byrne's conflicting view of Krypton, the Birthright origins of Jor-El, Krypton, and Luthor have recently been retconned, and, following Infinite Crisis, they are no longer valid in comics canon. However, a more recent storyline co-written by Geoff Johns and Superman director Richard Donner presented yet another version of Jor-El and Krypton which reintroduced General Zod and the Phantom Zone criminals into mainstream continuity. With art by Adam Kubert, Jor-El is depicted for the first time with a beard and the design of Kryptonian society is distinct yet again from Birthright and Man of Steel, incorporating elements of Donner's work on the first two Christopher Reeve films, in particular the notion of Krypton's Council threatening Jor-El with harsh penalty of exile to the very Phantom Zone he himself had discovered if he were to make public his predictions of their planet's imminent doom or otherwise attempt to "create a climate of panic." Jor-El is shown here to have been mentored by friend and noted scientist Non, who corroborated Jor-El's findings regarding Krypton's impending destruction, when the two were arrested and brought to trial before the Council by Zod and Ursa. When Non defies the Council's dire prohibitions and elects to spread the word of the coming apocalypse, he is abducted by Council agents and apparently lobotomized, thus explaining the character's mute simple-mindedness, brutality and destructiveness in line with Jack O'Halloran's performance as Non in the first two Reeve films. Appalled, Zod and Ursa propose to Jor-El that they band together and overthrow the Council, but Jor-El will have none of it. When their murderous insurrection fails, the Council forces Jor-El to exile them to the Phantom Zone and never speak of his findings again, lest he face the same fate. For this perceived betrayal, Zod declares that he will escape and conquer Krypton (confident that Jor-El will actually discover some way to save the planet) and force the scientist and his son to kneel before him one day. Having been re-built via a Kryptonian crystal during the One Year Later story arc, the current version of the Fortress of Solitude, which was also designed to essentially be visually identical to the Donner and Bryan Singer films, now contains an advanced interactive "recording" of Jor-El which, although visually dissimilar to Marlon Brando, is otherwise identical in function to that featured in Superman Returns. In Superman/Batman #50, it is revealed that, years ago, Jor-El sent a probe to Earth that made contact with Thomas Wayne while he was on a drive with a pregnant Martha, the probe holographically transmitting Thomas' consciousness to Krypton so that Jor-El could better learn what kind of world Earth was to help him decide which of many possible candidates he should send his son to. Thomas tells Jor-El that the people of Earth aren't perfect, but are essentially a good and kind race who would raise the child right, convincing Jor-El to send Kal-El there. Thomas recorded his encounter in a diary, which was discovered by his son Bruce Wayne in the present day. Jor-El, as designed for The New 52, featured on Superman #0 (2013). Art by Kenneth Rocafort. Following the DC universe experiencing such massive 'resets' as Flashpoint and the Rebirth event,the character Jor-El is represented as Mister Oz, who has been monitoring Superman since his pre-Flashpoint counterpart appeared in the New 52 universe. Jor-El has appeared (usually briefly) in various media adaptations of the Superman story. 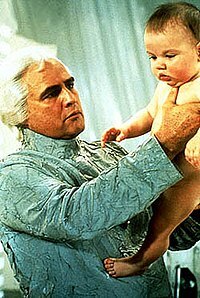 Marlon Brando as Jor-El, with a baby Kal-El played by Lee Quigley. Jor-El is portrayed by Nelson Leigh in "Superman Comes to Earth," the first chapter of the 1948 Superman movie serial. Portions of this depiction appear in flashback as Lex Luthor recounts the story of Krypton's destruction in "At the Mercy of Atom Man! ", the seventh chapter of the 1950 serial Atom Man vs. Superman. Marlon Brando played Jor-El in the 1978 film Superman, which Alexander Salkind, his son Ilya Salkind, and their business partner Pierre Spengler produced and which Richard Donner directed. In the movie, Jor-El is shown wearing the iconic "S"-shield symbol as the family crest of the House of El, resembling an Earth "S" by coincidence. The name "Superman" is later coined by Lois Lane due to the resemblance. In tandem, other Kryptonians are seen wearing their own individualized family crests. 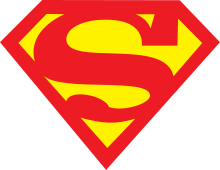 Originally thought up by Brando himself and suggested on-set, this origin of the famous Superman symbol has been used in many stories since. In the current comics, however, the shield is the Kryptonian symbol for "hope," and not only is it worn by Jor-El in a similar manner to Brando of the first feature film, but it adorns all manner of Kryptonian flags, clothing, spaceships, and equipment. Brando filmed additional footage for the sequel Superman II, before differences behind the scenes caused his footage to end up on the cutting room floor. It has been restored for the 2006 revised version, Superman II: The Richard Donner Cut. In the Richard Donner Cut, Jor-El again appears as a person to guide and inform Kal-El. Jor-El's historical crystals reveal to Lex Luthor the existence of the three Phantom Zone criminals General Zod, Ursa and Non, which makes Luthor realize just who and what they are (and that it was Superman who caused their release). Jor-El is asked by Clark if he can live a life as a human with Lois, and he tries to persuade Clark not to wish so, but Clark is firm in his wish. Jor-El then reveals the crystal chamber with the rays of Krypton's red sun which will make Clark human forever. Later, Clark returns to find all the crystals and information regarding Krypton destroyed, but finds the original crystal and is able to bring back Jor-El. Jor-El sacrifices his remaining life-force to restore his son's powers so that Superman can save Earth from Zod. Superman later destroys the Fortress after it has been breached by Luthor and the Phantom Zone criminals, but then goes back in time, where it remains normal. In 2006, two years after Brando died, he "reprised" the role of Jor-El in Superman Returns through the harvesting of archived video footage and sound clip outtakes. In the film, Lex Luthor, having retained vague memories of the place, returns to the Fortress of Solitude during Superman's absence to learn the power of the crystals. After stealing them, he uses one in a kryptonite tube to create a new continent that threatens to destroy North America. Superman manages to throw the "New Krypton" island out of the atmosphere and into space. Russell Crowe portrays Jor-El in Zack Snyder's reboot Man of Steel. In the film, Jor-El was regarded as Krypton's most brilliant mind and renowned scientist. He tries to warn the Kryptonian council that years of tapping the planet's natural resources have destabilized the core, and it is only a matter of time before the planet is destroyed. Jor-El attempts to gain permission to send the Kryptonian genetic codex to other worlds in hopes of preserving the Kryptonian race. However, General Zod, his old friend, interrupts his warnings and stages a rebellion against the council, offering Jor-El a large role in reshaping the planet's society. Jor-El refuses, after which he escapes from Zod's men and retrieves the codex from the Genesis Chamber. Jor-El is referenced in the first episode of the Superman theatrical cartoons as one of Krypton's "leading scientists sensing the approach of doom." He then placed Kal-El into a rocket and blasted it off toward Earth just as Krypton exploded. In 2011's direct-to-video animated film All-Star Superman, Jor-El and his wife Lara appear briefly in a flashback during the moment they sent their infant son Kal-El to Earth to survive Krypton's destruction. Also, a large statue of Jor-El and one of Lara are kept by Superman in his Fortress of Solitude. Jor-El is also mentioned by Superman when he reveals his origins to fellow Kryptonians Bar-El and Lilo. An alternate version of Jor-El appears in Justice League: Gods and Monsters, voiced by Yuri Lowenthal. Before he could implant his genetic code onto the ship that would have formed Kal-El, General Zod shows up and shoots him to implant his genetic code on instead, leading that version of Superman to grow up to look and behave more like Zod. Jor-El appears in Teen Titans Go! To the Movies based on Marlon Brando in the 1978 film Superman, voiced by Fred Tatasciore. Jor-El was played by Robert Rockwell (who went uncredited on-screen) in "Superman on Earth," the first episode of the 1952 television series Adventures of Superman. Jor-El was "played" by George Lazenby, who was actually playing the role of an alien disguised as Jor-El, in the late 1980s television program Superboy, which Alexander Salkind and his son Ilya Salkind produced for first-run syndication. In Lois & Clark: The New Adventures of Superman, David Warner played Jor-El in the episode "Foundling." From a small Kryptonian globe in the spacecraft that carried him to Earth, Clark Kent begins to see holographic messages from his biological father. Jor-El details Krypton's destruction and how he saved his son by sending him to Earth in a small experimental spaceship. Jor-El recites an old Kryptonian saying: "On a long road, take small steps." Jor-El appears briefly in a flashback in the episode "Never On Sunday," played by an unknown actor. François Giroday played Jor-El in the episode "Big Girls Don't Fly" where Clark learns that he was married, at birth, to Zara, which was apparently a common ritual on Krypton prior to its destruction. 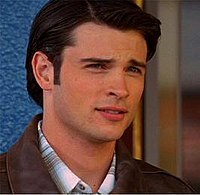 Tom Welling as young Jor-El in Smallville in the show's third season episode "Relic". Julian Sands as Jor-El in the ninth season Smallville episode "Kandor". In Smallville, Terence Stamp voiced the disembodied spirit of Jor-El in 23 episodes from Season 2 to Season 10. Jor-El first appears to Clark as a voice emanating from the spaceship that brought Clark to Earth, informing him that it is time to leave Smallville and fulfill his destiny, a destiny that Clark believes is to conquer the world. Clark does not want to leave Smallville, so he destroys his spaceship, but this triggers a shockwave that causes Martha Kent to suffer a miscarriage, prompting Clark to flee Smallville in shame. Three months later, Jor-El and Jonathan make a deal: Jor-El will give Jonathan the power to bring Clark home, but only if Jonathan agrees to give Clark to him when the time comes. In Season 3's "Relic", it is revealed that Jor-El (portrayed by Tom Welling in flashbacks) came to Smallville as a "rite of passage" by his own father. Jor-El also had a romantic relationship at the time with Lana Lang's great-aunt Louise McCallum before her death. It is deduced by Clark that Jor-El chose the Kent family to be Clark’s adoptive family after having a positive experience with Jonathan’s father Hiram Kent. In the season three finale, Jor-El makes good on his deal, and takes Clark from Smallville. He returns Clark three months later, re-programmed as "Kal-El" to seek out the three stones of knowledge so that he can fulfill his destiny; Clark fails to retrieve all three stones immediately, which results in a "great evil" arriving on Earth. With the three stones united, Clark uses them to form the Fortress of Solitude, where Jor-El informs him that he needs to begin his training in order to fulfill his destiny. That training is interrupted by two Kryptonian disciples of Zod (a criminal from Krypton imprisoned in the Phantom Zone) who proceed to destroy Smallville looking for Clark. As a consequence, when Clark does not return, Jor-El strips him of his powers. When Clark is killed in his mortal body, Jor-El resurrects Clark with his powers returned, but informs his son that someone he loves will have to take his place in death; that person turns out to be Jonathan in Season 5. Jor-El warns Clark about his cousin Kara in Season 7, the daughter of Jor-El’s brother Zor-El. It is revealed that Zor-El attempted to assassinate Jor-El. Clark's consistent disobedience forces Jor-El to imprison his son in a block of ice. After learning that a clone of Clark has returned to Smallville, Jor-El frees his son so that he can take care of the bizarre creature. In the Season 8 episode "Abyss", Clark talks to Jor-El about his actions and convinces him to start trusting him. Jor-El helps Clark save Chloe from Brainiac and warns Clark about Doomsday. As Clark leaves, Brainiac emerges from hiding, "kills" Jor-El and takes over the Fortress, stating that Doomsday is coming. In Season 9's episode "Savior," Clark has managed to fix the connection with Jor-El and has begun his training. He trains for three weeks when, while on duty in Metropolis, he found Lois on a monorail train that he had rescued. When he returned to his training, Lois kept clouding his judgment and when Clark asked why he couldn't fly yet, Jor-El told him that something or somebody is holding him back and that to fully embrace his Kryptonian side, he must leave his human life behind fully. In "Echo", Jor-El gives Clark temporary telepathy as part of his trials. In "Metallo", during an investigation of Kryptonian sightings on Earth following the defeat of Metallo at the hands of Clark, Tess finds Jor-El in the center of a burnt crest of the House of El. In "Roulette", Jor-El tells Clark about Alia's origins and informs him that more Kryptonians may have come to Earth. Terence Stamp's name was deliberately kept out of the opening credits in order to keep the secret that he was voicing Jor-El. Stamp originally portrayed General Zod in the first two Superman films starring Christopher Reeve. 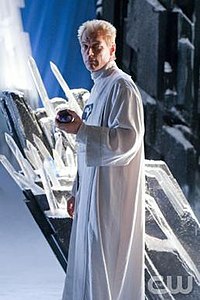 Apart from Welling's portrayal of the character, Jor-El himself, with the exception of one glimpse during a flashback in the episode "Memoria", was not seen until Season 9's "Kandor". Jor-El (Julian Sands) is released from the Orb as a clone of his younger self from 20 years before the destruction of Krypton and the birth of his son Kal-El. Jor-El is captured and tortured by his former friend, now foe, Zod, to learn the secret of activating his powers. Jor-El escapes and dies in the arms of his son, his last request being for Kal-El to save Zod. In the Season 9 finale "Salvation," Zod destroys the crystal console by which Kal-El communicates with the essence of Jor-El, apparently cutting off Kal-El's contact with his father forever. However, in the Season 10 premiere "Lazarus," it is revealed that Jor-El's essence has survived, and he warns of the coming of Darkseid, simultaneously taking away a suit that Martha had made for her son until Clark is ready to be a hero, feeling that Clark's recent willingness to kill a clone of Lex Luthor shows that he is not worthy to be the hero Jor-El thought he would become. Julian Sands reprised the role of Jor-El in the episode "Abandoned", appearing in the form of a holographic message that Jor-El and Lara had recorded for Kal-El shortly before his ship was launched. The message features Jor-El and Lara assuring their son that they have faith in him, and also explaining that Jor-El's cold attitude stems from the fact that the original Jor-El only sent along with Kal-El his knowledge, holding back his emotions because he worried that he might be guided to be too easy on his son when the time came for him to face his challenges. When Darkseid launches his final assault on Earth and Apokolips descends upon Earth, Jor-El and Jonathan's spirit inform Clark that, to be a true hero, he must accept not only his Kryptonian powers, but the human spirit he learned from the Kents, Clark subsequently donning the Superman suit for the first time to stop Apokolips. The comedy series How I Met Your Mother parodies a floating Jor-El head via a hologram of Barney Stinson (Neil Patrick Harris) telling his friend Ted that he wants to relinquish his apartment which he calls The Fortress Of Barnitude (a parody of the Fortress of Solitude) to him, in the episode "The Fortress." The floating Jor-El head is also mentioned by Marshall Eriksen (Jason Segel) in the episode "Something New." Jor-El briefly appears in the 2015 pilot episode of Supergirl. He is seen putting Kal-El into his ship during Krypton's destruction prior to Kara's own escape. He is portrayed by an uncredited actor. Kara later quotes her uncle to J'onn J'onzz in the Season 3 episode "In Search of Lost Time" when J'onn struggles with his father M'yrnn's deteriorating mental condition: "The son becomes the father, and the father the son." Jor-El is mentioned in the prequel series, Krypton. 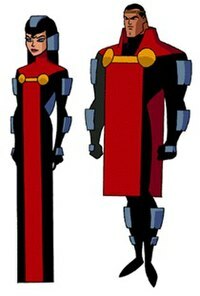 Jor-El and his wife Lara in the first episode of Superman: The Animated Series. Jor-El is also seen in three episodes of the Super Friends. He appears in the first season episode "The Planet Splitter," voiced by Casey Kasem. Jor-El's next appearance was in the Challenge of the Super Friends episode "Secret Origins of The Superfriends," voiced by Stan Jones. His last appearance was the 7th season short episode called "The Krypton Syndrome." In the 1988 animated series Superman, the Man of Steel mentions that his father Jor-El was the creator of the Phantom Zone, which holds General Zod and his two Kryptonian companions. Jor-El is only mentioned, but he is not shown. In the 1990s-era Superman: The Animated Series, Jor-El is the main protagonist of Part 1 of the series' triple-length premiere episode, "The Last Son of Krypton". This version of Jor-El attempts to convince the leaders of Krypton’s eventual destruction but is denounced by Brainiac. Suspicious, Jor-El discovers that Brainiac also knew of the planet's fate and instead of finding a solution, he begins downloading himself to a satellite to preserve Krypton’s knowledge. The character is voiced by Christopher McDonald. In the two-part Justice League episode "Twilight", Jor-El and Lara make a cameo in a picture shown to Superman by Brainiac when he attempts to renew his offer of exploring the universe and collecting knowledge. Jor-El also appears in the Justice League Unlimited episode "For The Man Who Has Everything," an adaptation from the print story of the same name written by Alan Moore, which originally appeared in 1985's Superman Annual. In the story, Superman has an induced fantasy where he sees what his life would be like if Krypton had not exploded. Here, Jor-El is portrayed as an old man whose "sky-is-falling" theories disgraced him, but has done well enough for himself since then to have a sense of humor about it. As a bit of an in-joke, his facial design matches Superman's from the first season of Justice League. Jor-El's voice is again provided by Christopher McDonald. His last line of dialogue in the episode, however, is done by Mike Farrell (voice of Jonathan Kent) as a sign of Superman realizing the truth about the fantasy. Though Jor-El does not appear in person, he is referenced by Christopher McDonald voicing an older Superman in the Batman Beyond two-parter "The Call." The producers have claimed that Superman's original voice actor, Tim Daly, was available at the time of production, but they opted to cast McDonald to strengthen the father-son connection between Jor-El and Superman. The Silver Age versions of Jor-El and Lara appear in the Pinky and the Brain episode "Two Mice and a Baby" as they place an infant Kal-El in his ship as Krypton crumbles. Jor-El is voiced by Jeff Bennett. Jor-El also appears in the Legion of Super Heroes animated series. He appears in the episode called "Message in a Bottle." In that episode, he was shown in a flashback, which was a story told by Brainiac 5, referring to the time when the original Brainiac (known as Brainiac 1.0 by the 31st century) shrank Kandor and destroyed the entire planet Krypton. Jor-El is also featured in the animated web series Kara and the Chronicles of Krypton, a spin-off of the television series Smallville. In The Looney Tunes Show episode "Best Friends", Daffy and Bugs decide to enter a game show where two best friends test their knowledge of each other. Much to Bugs' annoyance, Daffy does not know anything about him, nor does he care in the slightest (falling asleep as soon as Bugs began his overview of himself). To get Daffy's attention, Bugs states that he is from the planet Krypton, and his parents (parodying Jor-El and his wife) sent him to Earth, where he'll be able to "jump higher than normal people, eat carrots, and instinctively say, 'What's up, doc?'". Bugs is even more irritated when Daffy falls for the story, and when explained that it is the origin of Superman, Daffy reveals he has no idea who Superman is either. In the episode "SuperRabbit", Bugs tells Daffy another tale depicting him as the superhero SuperRabbit. Jor-El is shown prosecuting General Zod, Faora, and the robot Thunkian for their crimes, but to his annoyance, the council pronounces them guilty and sentences them to the Phantom Zone before he has finished his opening statement. Later, the criminals escape the Phantom Zone and defeat SuperRabbit, forcing him to escape. SuperRabbit retreats to the Fortress of Solitude and consults the interactive hologram of Jor-El for guidance. Jor-El scolds him for becoming overconfident and showboating. After SuperRabbit apologizes and promises to do better, Jor-El advises that he use his brain instead of relying solely on brute force. After the criminals are defeated, Jor-El takes on physical form and comforts his son when he decides to retire from being a superhero. Jor-El was voiced by Jeff Bergman in both appearances. In the episode "The Delivery", Dilbert gives birth to a "half-alien, half-hill-billy, and half-robot" baby that Dogbert sends into outer space at the end of the climax. The baby's destination is revealed to be Krypton, where a depressed Jor-El and Lara are embarrassed by their proven false claims of their planet's destruction and the loss of their son over a false alarm. However, they eventually get over it when Dilbert's baby arrives, as foretold to them by Dogbert. In the Superman Returns video game, Jor-El appears in the cutscene when Lex Luthor breaks into the Fortress of Solitude and takes the Kryptonian crystals of the Fortress. Jor-El also teaches the player how to use the controls in the beginning of the game. Jor-El appears in the DC Universe Online video game, voiced by William Price. A large statue of Jor-El and Lara can be seen in the Fortress of Solitude stage in Mortal Kombat vs. DC Universe. The Man of Steel versions of Jor-El and Lara appear as playable characters in Lego Batman 3: Beyond Gotham, voiced by Nolan North. In the Man of Steel DLC map, Jor-El had to fight through General Zod's forces to make sure that baby Kal-El and the Codez can be launched off of Krypton and far away from General Zod's forces. After beating Tor-An, Faora, and General Zod, Jor-El, Kara, and Kelex were able to send baby Kal-El off of Krypton. Jor-El of the One Earth Regime universe is mentioned several times in Injustice 2. When saving her daughter from Brainiac's drones, Alura shows her a ship she had been working on and tells her that Jor-El has created one for her cousin Kal-El, entrusting Kara with raising her baby cousin. Jor-El, his wife, and Alura are killed when Brainiac destroys Krypton, though Kara's ship is knocked off course which puts her into hyper sleep. Kara is later found by Black Adam who hides from her the tyrannical nature of Superman's Regime and trains her alongside Wonder Woman to help reestablish the Regime, though Brainiac's attack forces them to try and break Superman out of the Red Son Prison. Superman is surprised to see Kara who he recognizes as his protector and they briefly talk about his parents. However after witnessing Wonder Woman's brutality towards Cheetah and Harley Quinn, Kara is horrified to learn the truth of the tyrant her cousin has become, even asking him if he is Jor-El's son or General Zod's before attempting to flee the Fortress of Solitude. After Brainiac's defeat, Kara ends up siding with Batman and his allies against the Regime. As she confronts her cousin in the Batcave, she tells Superman that she is glad Jor-El is not alive to see the monster his son has become and tries to reason with her cousin by telling him the story of how his father opposed tyrannical General Zod. However Superman reveals he approves of Zod's tyrannical methods and believes if his father had been more like Zod, then he would have saved Krypton causing Kara to realize how far he has fallen. Though Jor-El does not appear physically, a statue of him and his wife appears in the Fortress of Solitude which fighters can interact with to knock their opponent into the face of one of the statues. In the Elseworlds series Superman: The Last Family of Krypton, Jor-El was able to save himself and Lara and accompany Kal-El to Earth, where Jor-El sets up the corporation JorCorp while Lara establishes the self-help movement 'Raology'. Although Lara is willing to adapt to life on Earth, arranging for Kal-El to be discreetly adopted by the Kents so that he can live a more normal life, and later has twin children, Bru-El and Valora, whose 'stunted' genetics due to their birth on Earth mean that they only possess half of the superhuman potential of their brother, Jor-El is particularly focused on scientific development above all else, even spending a large portion of his time in a chair that downloads information about Earth directly into his brain so that he can keep track of Earth's development in order to cut off any attempt to prevent a similar disaster befalling Earth as happened on Krypton. Although his actions hinder Earth by keeping humanity essentially dependent on him, Jor-El argues that Earth only needs his family to protect them, such as telling the Guardians of the Universe not to bother appointing a Green Lantern to Earth. Jor-El hires Lex Luthor to work at JorCorp, Luthor eventually attempts a complex plan to destroy Jor-El's reputation with the aid of his reprogrammed A.I. B, feeling that Jor-El is nothing more than a megalomaniac with a superbrain and a god complex who would always undermine his accomplishments. After Luthor's plan turns Bru-El against his family as a kryptonite-powered superhuman, he nearly kills his father before Lara sacrifices herself to save her husband, Kal-El managing to defeat his brother after he expends so much of his kryptonite energy in the early attack. Recognising the flaws in his past actions, Jor-El steps back from the public eye, becoming a simple wanderer of Earth and other planets, while allowing Kal-El to act as the official hero as Superman. In the Elliot S! Maggin 1978 novel Superman: Last Son of Krypton, Jor-El is shown as having sent a navigation probe ahead of Kal-El's spaceship, in order to find a suitable foster parent on his new planet. In Kryptonian society, scientific achievement was a preeminent virtue, so Jor-El's probe was programmed to seek out the leading scientific mind on Earth, presumably to adopt Kal-El. The probe landed (in the early 1950s, although the date is non-specific) in Princeton, New Jersey, where it soon appeared outside the window of Albert Einstein and communicated its mission to him through telepathy, along with precise details of where Kal-El's rocket would land (near Smallville, Kansas), several days later. Einstein then traveled incognito to Smallville to seek out a suitable family; this required his sneaking away from fawning government handlers assigned to protect/baby-sit Einstein as a vital national resource. In the course of several days in Smallville, he encountered Jonathan and Martha Kent, and decided that they would be ideal foster parents for the Kryptonian child, due to their honest and generous natures. Through a variety of ruses, Einstein arranged for the Kents to be in the immediate area when Kal-El's spaceship landed, thus ensuring he would be found and later adopted by them. The last sequence shown in the novel has Kal-El, now grown up to become Clark Kent/Superman, reading a letter that Einstein had written to him, using the written Kryptonese language, in which he explains the sequence of events. Superman realizes his heroic career was no random occurrence, but the result of foresight on the parts of both Jor-El and Einstein. In the 2007 novel The Last Days of Krypton by Kevin J. Anderson, Jor-El is shown as a science hero who is respected and admired by all of the people of Krypton and has a standing offer of a place on the Council. Yet his clashing with this conservative Council over new discoveries supplies much of the tension in the book. General Zod and his two minions make a bid to take over Krypton, first posing as Krypton's saviours. At the start of the novel, Jor-El's research discovers the Phantom Zone, and he meets his future wife when he becomes trapped in it until she rescues him. In the novel, Jor-El has only one brother, Zor-El, who is two years his junior, and their parents are Yar-El (a revolutionary scientist slowly dying of what is known as the Forgetting Disease) and Charys (a renowned psychologist who continues to study and attempt to reach her beloved husband). His wife Lara Lor-Van is an historian and, like her parents Ora and Lor-Van, an accomplished artist. A major change involved Jax-Ur, a Phantom Zone inmate that fought Superman at times in the 1960s. Anderson moved him a thousand years into the past and his attempts to conquer Krypton – before his death at the hands of a minion – led to the Council's attitude towards new scientific discoveries. ^ a b Cronin, Brian (16 October 2008). "Comic Book Urban Legends Revealed #177". Comics Should Be Good. Comic Book Resources. Retrieved 3 September 2013. ^ "Superman Finds A Dad: Russell Crowe Joins 'Man Of Steel' – MTV Movie News". MTV. 2011-06-15. Retrieved 2011-07-14. ^ Richard Fielding & Whitney Ellsworth (writers); Tommy Carr (director) (1952-09-15). "Superman on Earth". Adventures of Superman. Season 1. Episode 1. Syndication. ^ Dan Levine (writer); Bill D'Elia (director) (1994-02-20). "Foundling". Lois & Clark: The New Adventures of Superman. Season 1. Episode 16. ABC. ^ Brad Buckner & Eugenie Ross-Leming (writers); Philip Sgriccia (director) (1996-05-12). "Big Girls Don't Fly". Lois & Clark: The New Adventures of Superman. Season 3. Episode 22. ABC. ^ Alfred Gough, Miles Millar (writers) & Greg Beeman (director) (2003-05-20). "Exodus". Smallville. Season 2. Episode 23. The WB. ^ Kelly Souders, Brian Peterson (writers) & James Marshall (director) (2003-10-08). "Phoenix". Smallville. Season 3. Episode 2. The WB. ^ Kelly Souders, Brian Peterson (writers) & Marita Grabiak (director) (2003-11-05). "Relic". Smallville. Season 3. Episode 6. The WB. ^ Miles Millar, Alfred Gough (writers) & Greg Beeman (director) (2004-05-19). "Covenant". Smallville. Season 3. Episode 22. The WB. ^ Miles Millar, Alfred Gough (writers) & Greg Beeman (director) (2004-09-22). "Crusade". Smallville. Season 4. Episode 1. The WB. ^ Todd Slavkin, Darren Swimmer (writers) & Greg Beeman (director) (2005-05-18). "Commencement". Smallville. Season 4. Episode 22. The WB. ^ Todd Slavkin, Darren Swimmer (writers) & James Marshall (director) (2005-09-29). "Arrival". Smallville. Season 5. Episode 1. The WB. ^ Kelly Souders, Brian Peterson (writers) & Whitney Ransick (director) (2005-10-13). "Hidden". Smallville. Season 5. Episode 3. The WB. ^ Kelly Souders, Brian Peterson (writers) & Greg Beeman (director) (2006-01-26). "Reckoning". Smallville. Season 5. Episode 12. The WB. ^ Todd Slavkin, Darren Swimmer (writers) & James Conway (director) (2007-10-04). "Kara". Smallville. Season 7. Episode 2. The CW. ^ Todd Slavkin, Darren Swimmer (writers) & Glen Winter (director) (2007-11-15). "Blue". Smallville. Season 7. Episode 8. The CW. ^ Don Whitehead, Holly Henderson (writers) & Todd Slavkin (director) (2008-01-31). "Persona". Smallville. Season 7. Episode 10. The CW. ^ Alfred Gough, Miles Millar (writers) & Miles Millar (director) (2004-04-28). "Memoria". Smallville. Season 3. Episode 19. The WB. ^ Alan Burnett, Paul Dini & Bob Goodman (writers); Dan Riba (director) (1996-09-06). "The Last Son of Krypton". Superman: The Animated Series. Season 1. Episode 1. The WB. ^ Rich Fogel & Bruce Timm (writers); Dan Riba & Butch Lukic (directors) (2003-07-05). "Twilight (Parts 1 and 2)". Justice League. Season 2. Episode 1 & 2. Cartoon Network. ^ J. M. DeMatteis (writer); Dan Riba (director) (2004-08-07). "For The Man Who Has Everything". Justice League Unlimited. Season 1. Episode 2. Cartoon Network.